While the #noteenshame team is discussing our next steps of action there are several ways you can help! Please note #noteenshame is NOT calling on The Candie Foundation to close we are simply asking for a meeting. At this point it has been OVER MONTH and still all of our calls, tweets, emails, voicemails, EVERYTHING have received NO response Candies CEO, Neil Cole. As a brand Candies is making it clear that they do NOT feel teenage parents are an audience he needs to respond to although he is using our lives as a way to make money off of ads. 1. Photo Campaign. Join our virtual rally today! 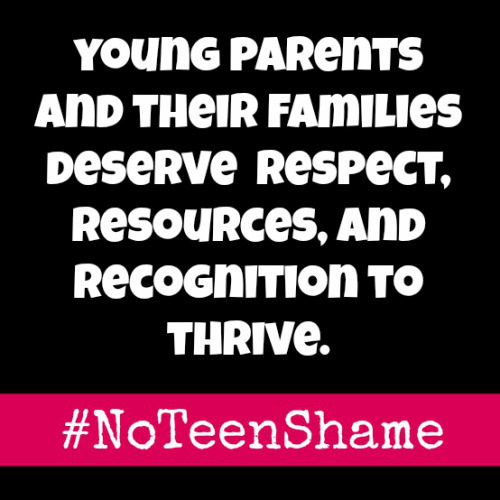 Download and print the #NoTeenShame PDF and write in your reasons for supporting. If you feel comfortable, please tweet @CandiesOrg a photo holding the sign and use the hashtag for increased visibility. 2. Tweet. Share your stories on twitter all week using the #NoTeenShame hashtag. Only you know your story and only you have the power to tell if effectively. Show @CandiesOrg that young parents deserve respect, not shame. 3. Blog. If you are a blogger, please write about the #NoTeenShame campaign and why it's important to you. Whether you are a young parent, a young parent's parent, the child of a young parent, or a supporter, your voice is an important part of our campaign. If you are interested in writing for ThePushback.org as a guest blogger on any topic related to parenting young, please let me know. 4. Recruit. Please share this info or forward this email to anyone you know who may want to support this campaign. If anyone has questions, feel free to pass along my email- Gloriamalone@teenmomnyc.com and/or Natasha's email-nt.vianna@gmail.com. Hi, my name is ___ and I am calling from (city, state). I wanted to let Mr. Neil Cole know that young parents have launched a campaign on Change.org asking him to meet with young parent activists and supporters to discuss the teen pregnancy prevention campaign conducted by the Candie's Foundation. Please call us back at your earliest convenience at 781.296.3550. Have a wonderful day. Are you your child's best coach?